4 Extra Debut. 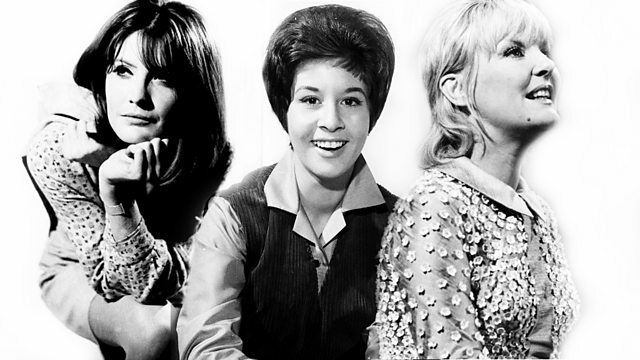 Sue MacGregor is joined by five women who helped make the '60s swing: Petula Clark, Sandie Shaw, Helen Shapiro, Jackie Trent and Vicki Wickham. From August 2012. In this edition of The Reunion, Sue MacGregor reunites five women whose pop success helped make the sixties swing. When people think about the music of the sixties, generally they think of The Beatles and The Rolling Stones, but the girl singers of the period were also highly successful and important. In the UK alone, Cilla Black had seventeen top forty hits, Dusty Springfield and Sandie Shaw had fifteen and Petula Clark had thirteen. This doesn't include the success they all enjoyed abroad: these girls were international stars having hits all over Europe and in the United States. But success did not always bring happiness and, for many of the girl singers of the period, there were major lows alongside the dizzying highs. The sixties may have been swinging, but it wasn't an easy time for the women of the period who, as well as having to navigate the vagaries of a career in show business, often found themselves the focus of enormous attention from the media and the public. It wasn't always welcome. The gulf between their public lives and their private lives was sometimes huge. Joining Sue MacGregor is: Petula Clark, the child star of the 1940s whose career went stratospheric in the 1960s; Sandie Shaw, the barefoot pop princess who won the Eurovision Song Contest; Helen Shapiro, Britain's first teen pop star who was supported by The Beatles, Jackie Trent, singer and songwriter who wrote hits for Petula Clark, Scott Walker and many others; and Vicki Wickham, the legendary producer of Ready Steady Go who went on to manage Dusty Springfield. A selection of the best editions of the programme.